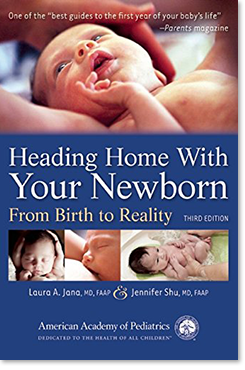 Now in a fully-updated second edition, this comprehensive guide for new parents finding themselves overwhelmed dealing with the reality of parenting provides "parent-tested, pediatrician-approved" advice to allay their fears. Written in a compassionate yet authoritative tone by two moms who are also pediatricians, this guide covers a wealth of topics that often prove daunting in the first eight weeks of a child's life. Starting with "Into the Mouths of Babes" (the trials of breastfeeding) and "What Comes in Must Come Out" (a discussion of "pee and poop") and moving on through "Fever: Trial by Fire" and "Seeing Yellow: Jaundice," this guide offers sound advice that will enable parents to feel confident about their parenting skills. Hints on daily living, sleep patterns, crying, the art and science of diapering, and traveling with a newborn are also provided. American Academy Of Pediatrics (2015 - 3rd Edition), 375 pgs.